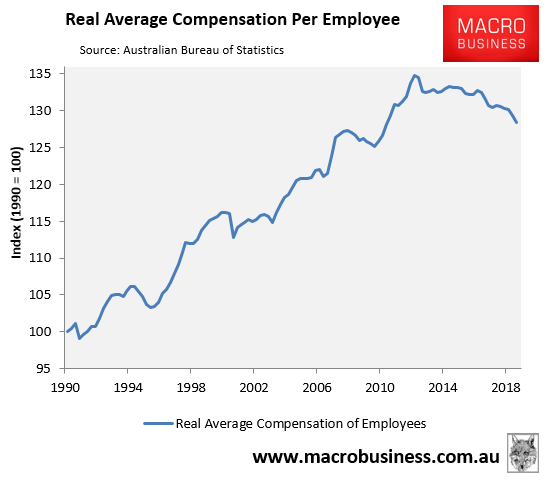 …Yet Labor has not only recovered but is ahead. The latest Herald poll, conducted across the state on the weekend, has Labor leading the Coalition 51 to 49 on a two-party-preferred basis. The Victorian election wasn’t just lost on state issues. Any objective assessment of Labor’s Daniel Andrews would say that he carried a lot of baggage. He was a dithering Premier, at best, costing the state dearly in jettisoning road projects, failing to deliver on a host of other promises, with a string of his ministers and their staff having rorted the electoral system, and operating as a total captive of the union movement. Why was all this ignored, so decisively, by the Victorian voters? What caused the unexpected collapse in Liberal support in such taken-for-granted strongholds as Caulfield, Brighton, Hawthorn and Prahran? It’s not enough to fall into denial – to blame state issues, or refer to Victoria as Australia’s Massachusetts. It’s nearly a third of Australia. The reality is that the Liberal brand is damaged. The party is now characterised by disunity and disloyalty, by tribalism, not by principle or policy but by personal interests – not even party interests and certainly not the national interest. That led to the collapse of Tony Abbott’s polling. When the same polities were sustained under Malcolm Turnbull it led to the collapse of his polling as well stoked the rise of One Nation in QLD. From there we tipped into internecine party politics which included climate change failures. Berejiklian’s total failure to come to grips with the Sydney crush-loading, and her late turn on that subject, appears to have come too late. She could well lose to an empty chair. Gladys needs to charge foreigners $40/day for a train ticket. Her “faster rail” announcement is designed to take attention away from her refusal to cut immigration. Gladys does not control immigration. That is in Scummy’s gift. Gladys can charge every kid of every 457 visa worker $10k/year for studying in a NSW government school. She can double her land tax on foreigners to 4%. Put in a rental tax on foreigners too. Charge foreign “students” $40/day for a train ticket. Scummo recently said “let each state decide how many immigrants they let in”. Jacob, anywhere you go around the world, the price of a train ticket is largely similar between local residents, temporary residents and tourists. To give Gladys credit and yes, I feel awful for doing it, she is at least pressuring the federal counterparts over immigration. Granted she could have done it earlier or try to extract more concessions, but at least she is having some attempt to push back. If she was serious, as Jacob points out, there are many things that could be done. The reality is it’s just lip service while they reap the benefits of mass immigration, same as the feds. costing the state dearly in jettisoning road projects – it was O’Brien as state treasurer in the Naptheine government that did that with his side letter. Pity Hewson doesn’t understand that that was one of the things (apart from having the unelectable Guy as leader) that made it difficult for people to consider voting for them. Yes, that has cost the state dearly, but the new road projects (WestGate tunnel and NE Link) will also cost the state dearly. WestGate tunnel also has the poor benefits (costs more than the benefits) that EW Link does and NE link will cost $16B (before cost blowouts). $16B could easily bring in better signalling for the rail network and fix perennial rail faults. Most people that I know didn’t really want Andrews or Guy and thought both were crooks, it is just they through that Guy was more crooked. I thought that poo hat was childish, now it’s growing on me. Despite all the Liberal Party’s failures, Gladys’ government is delivering on infrastructure for the ponzi better than Labor ever has/will. Daley is already promising to cancel numerous rail/road projects. 1 major rail line, 2 light rail lines and 2 major road tunnels are due to come online next year, unfortunately all after the election. People think the opposition will be better but the previous 16 years of Labor says nil will be built. Gladys should change her name. Nobody named Gladys can ever be taken seriously. I’m prepared to make an exception.